Worry About Hunger, Homelessness Up for Lower-Income in U.S.
WASHINGTON, D.C. -- Over the past two years, an average of 67% of lower-income U.S. adults, up from 51% from 2010-2011, have worried "a great deal" about the problem of hunger and homelessness in the country. 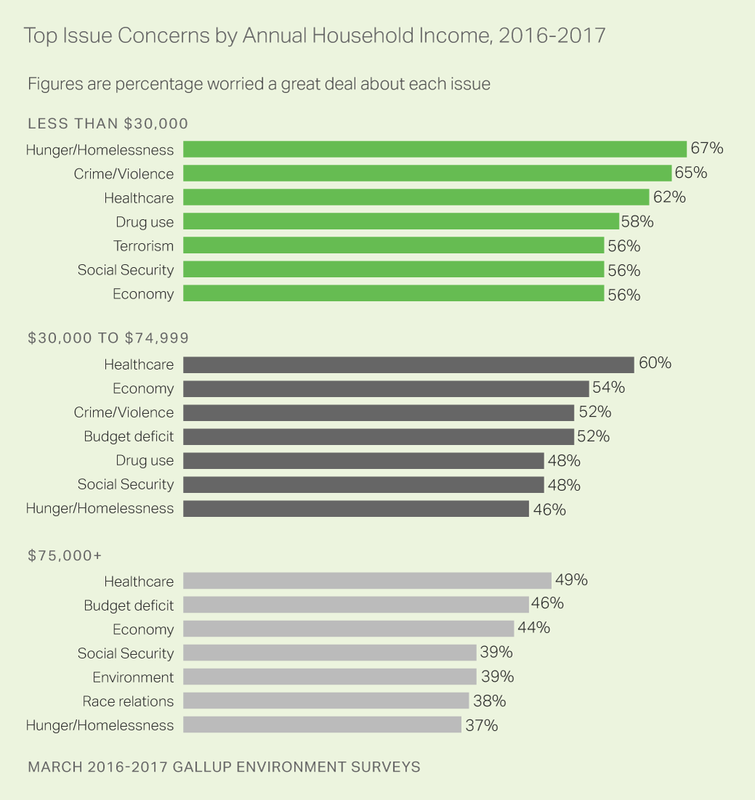 Concern has also increased among middle- and upper-income Americans, but they still worry far less than do lower-income Americans. 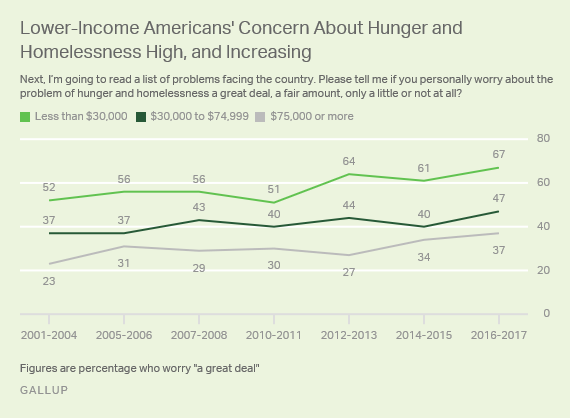 Since 2001, worry has been highest among those residing in lower-income households, likely because those with limited financial resources are more at risk of going hungry or becoming homeless. A consistent majority of lower-income adults worried about the problem before 2012, but that has only increased in the past five years. 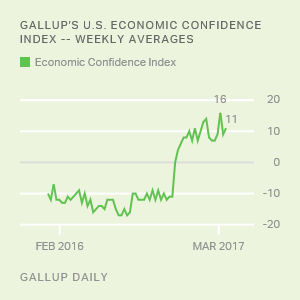 Concern among middle-income Americans in 2016-2017 falls just short of the majority level at 47%, while 37% of upper-income Americans are worried. 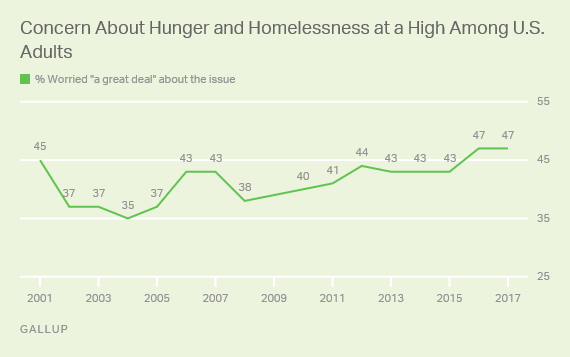 It is unclear why Americans are worrying more about hunger and homelessness now, since it is an ever-present problem. But at times the issue may fade from public consciousness when other matters dominate the national agenda. It is possible that greater concern will lead to greater public pressure for action on the issue. However, President Donald Trump's first federal budget has been criticized for deep cuts to federal anti-poverty programs. If Trump's budget passes largely as it has been outlined, then state and local governments, charitable organizations and private citizens would need to increase their efforts to help reduce poverty and its effects -- or hope that the president's economic policies expand opportunities for the most financially vulnerable in society. Results by income are based on combined 2016-2017 data. For results based on the total sample of 348 adults whose annual household income is less than $30,000, the margin of sampling error is ±7 percentage points at the 95% confidence level. For results based on the total sample of 732 adults whose annual household income is between $30,000 and $74,999, the margin of sampling error is ±5 percentage points at the 95% confidence level. For results based on the total sample of 735 adults whose annual household income is $75,000 or greater, the margin of sampling error is ±5 percentage points at the 95% confidence level. All reported margins of sampling error include computed design effects for weighting. Of 28 aspects of U.S. society, Americans are most satisfied with the quality of life and least satisfied with race relations and anti-poverty efforts.